There are a variety of other insects to look out for on the Reserve. The invertebrate conservation charity Buglife have a Scotland website which is a mine of information. These colourful little beetles are not as common as they used to be, but the most likely one to be found is the 7-spot (Coccinella 7-punctata). 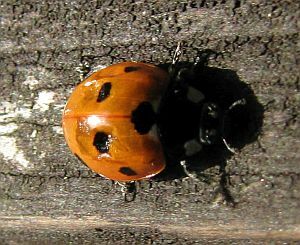 See the Ladybird Survey website for more information. Hoverflies are often mis-identified as wasps and wafted away or squashed. 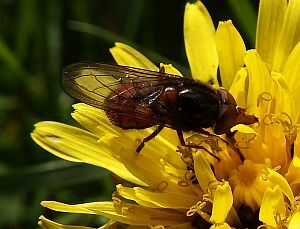 However, hoverflies are harmless (no sting) and great eaters of aphids so are loved by gardeners. 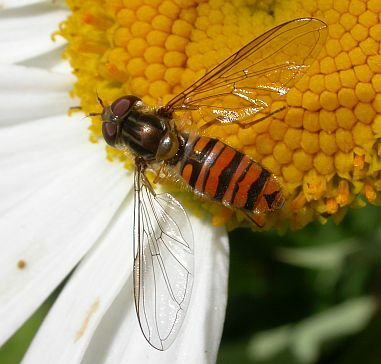 There are many different ones, but the most common is called the marmalade hoverfly (Episyrphus balteatus). Another interesting hoverfly is Rhingia campestris (sorry no common name for it).